Steve Hargadon: What Will Teachers Be Like in 10 Years? What Will Teachers Be Like in 10 Years? Yesterday I attended (as an observer) a one-day expert workshop on "The Future of Learning Agents," co-sponsored by the Institute for the Future and KnowledgeWorks Foundation. 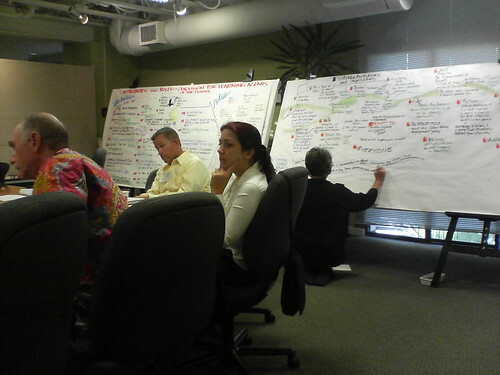 This one-day drill-down focused on one "hotspot" from their amazing Map of Future Forces Affecting Education. We were ably given a short tour of the map by Andrea Saveri, and I'd spent time some months ago looking at it--but even then, I'm still amazed at the information I keep finding in it. At one intersection on the map, where certain "Drivers of Change" identified for the next ten years intersect with the category of "Educators and Learning," is a trend predicted/identified as "An Explosion of Learning Agents." The job of the invited participants was to try to describe and understand that trend better: what will the teacher (learning agent) of 2017 be like? Salmon-Zhu was the professional graphic recorder at the workshop, and her information is at http://www.ifvp.org/directory/lsalmon-zhu/index.htm.] I take full responsibility for any inaccuracies, and will gladly correct anything that I have gotten wrong. Except for the notes I took during the introduction, I didn't regularly ascribe comments to specific individuals unless I wanted to for my own records. That youth production, apprenticeship, "prosumer"/"proam" creation--whatever you want to call it--will and should be a huge part of the learning experience of youth and adults. It is learning. And we are going into an age where true contributions will be possible by a much broader range of students than ever before. That learning will likely, and should likely, be perceived less and less as something done between 5 - 25 years of age. It's somewhat crazy that we do it that way now, anyway, but with the coming changes in jobs and careers, and the need for constant re-learning, it's hard to imagine our current paradigm of schooling-then-life will hold still. That parents are going to become more and more involved in managing the learning experiences of their children, and will be more frequently required, and want, to make choices and decisions about that learning. That we are going to inevitably care more about the interests and desires of children progressing through learning phases, and will customize their educational experiences based on these interest and their particular talents. And I think we'll be able to do so because of technologies that are now just coming to the fore. That we will also see the rise of learning coaches who both inside and outside of the public education system will help provide direction in the above. That we will find that we care less and less about formal teacher training, and will have to have other ways of measuring teacher/facilitator/coach/learning-agent capabilities. I think these measures will evolve out of the rating systems we see associated with for-hire programmers, or (gasp!) the books we buy at Amazon. That the character traits of self-learning, self-motivation, and self-determination--in a world of increasing choices and niches--will become key end-goals for mentors working with learners. I think we are hearing from business leaders that these are some of the character traits and learning skills that they value most highly (see my interview with Marc Andreessen). (Certainly, everyone at the workshop exemplified these traits.) And all of the descriptions of learning-agent in 10 years seemed (to me, at least) to be really built around these traits, with an implied understanding that they would not only be necessary for the work to be done, but also in order to build, support, and encourage them in students. And wouldn't these be the same traits of the learning organizations? I know, it's been said a million times, but if we want students to be learners, the teachers and schools must be learners. (One experience we did have with our home-schooled daughter was a program that reminded us that the best thing we could do as parents for our child's learning was to be actively engaged as learners ourselves. If we wanted our kids to read great books, we were reminded, start reading great books ourselves.) And couldn't we also expect that the organizations/institutions will also need to be self-motivated and self-determining? (Now there's a can of worms!) In the great examples of succeeding schools, is there a common thread of passionate, local leadership? If so, does that tell us something? That the characteristics that were listed for learning-agents in 10 years are not those that are the primary measures today, and in fact may actually be ones that would make it hard to be hired, or to stick around, the current educational environment. That the advent of Internet, and specifically the read/write or Web 2.0 aspects of publishing content as much as consuming it, will be historically and culturally one of the most significant events in mankind's history. Just as the printing press brought the huge social changes of the Reformation and the Renaissance, I would expect we will see changes (including and especially in education) in the next 5 - 50 years that are almost unimaginable now. It was interesting for me to be in a meeting in which there was a general consensus that technology is dramatically changing youth and educational experiences, but to only have a few laptops out and open. Even with general agreement that those involved in education were going to need to be more significantly involved in the current technologies, Will Richardson and I felt a little sheepish as we did some Skype back-channeling--which at some recent ed-tech conferences has been a real enhancement to the conference experiences, but here felt a little subversive. Maybe in the same vein, in a environment with such a general acceptance of openness and peer contribution, the event was pretty programmed. Which is not to say that there wasn't some good time for dialog, but even the dialog was being filtered through a single mediator. There was our one break-out session, but other than that all eyes were up front most of the time. To be fair, there was a pretty tight focus for the event, and it was organized and paid for to accomplish a specific purpose, but it reminded me of how hard it is, even for those of us who want to be forward-thinking in this new collaborative world, to really open up to full participation. And to take this train of thought one step further, I had a general feeling that it was hard for the group in general to let go of pre-set expectations for still being able to "manage" the changes that are certainly going to challenge traditional notions of education. I'm not sure how to articulate this fully, but I think this is something that is going to be hard for all of us: fully-collaborative, open, transparent problem-solving is really challenging when there are certain things we want to hang on to. The idea that we may not be able to control the outcome often pulls us back to wanting to manage the process. At one point the question was asked, "How do you change teaching and learning in a participatory culture?" I wonder if the answer may be: "You don't. In participatory culture, teaching and learning will change from a grass-roots level." I also felt this when there was a brief discussion about having families invite teachers for dinner. Just the day before, during a lunch with Will Richardson and Jim Daly and Cal Joy from Edutopia, the idea of an "invite a teacher to dinner" campaign had seemed so fun; when brought up in this workshop, it felt like an intrusion on the private time of the teachers. In the same way, I hear educators who haven't used IM with students worry that they won't have any free time away from school; while those who do use it tell you it is so rewarding and learning-oriented that they couldn't bear to give it up. I tend to use discussing our family's experience of home-schooling as a litmus test for others' openness to alternative educational ideas, and feel comfortable doing so since we've had such good experiences both in home-schooling and in public school. In this event, the fact that I felt like I sounded like a home-school advocate--which I usually try to avoid--was a clue to me that the expected outcomes were still being placed into traditional solutions. One participant said, "At some point, people are going to get so fed up with public school that they will opt not to go." I think that's already happened (home-schooling, charter schools, private schools), and again, voice my belief that the home-school movement can and should have a very informative role in understanding what more engaged, one-to-one learning, parent-involved education looks like. I also think that this relates to the sense I feel that we believe that we have to have ONE solution that fits everyone. That doesn't make sense to me. We'd never do it to a child, why would we do it to a whole educational system? My four children are each very different, and would flourish in very different educational environments. I'd like that kind of choice to be available. John Seely Brown was possibly slated to participate, but wasn't there. I would have liked his input. I have a recollection from my interview with him that he felt like implementing change from inside our current school system would be about as impossible as changing our auto-manufacturing culture. And that both are going to have to fail in order to be rebuilt. I remember listening to a podcast where he described how there is a built-in disincentive for the suppliers to the auto manufacturers to bring them an innovation, since it ends up actually increasing the likelihood that the manufacturer will take the idea and shop it out to other suppliers. I have often wondered about how a huge system like public education can possibly change, where almost everyone involved at all decision-making levels (both within the system and those who sell to it) has been measured and promoted based on existing priorities. I know I'm not the first one to say that schools often remind me that something that threatens the structure of a system will find itself "attacked" in the same way that the body fights off foreign invaders. Why is it that examples of schools that are already "revolutionary" and succeeding don't seem to really have a larger impact as examples? Is it because there is little opportunity to innovate and experiment in a bureaucratic "system," so examples don't mean much? I've been reading Dennis Littky's The Big Picture, and I've been underlining something in every paragraph. I almost yelled out "yes, yes!" several times as I was reading--especially when he talked about the 75-page autobiography that the students write, and the active involvement of parents in the educational process of the students. Laura Kretschmar, the founder of Lighthouse Charter School in Oakland, and Mark Morrison, the fonding Director of Napa New Technology High School both gave me the impression they were already walking the talk, and I was really glad they were invited. I'm thinking that the edublogger crowd I hang around in is beginning to think about school reform because of the amazing pedagogical implications of collaborative technology; and that we will benefit from also looking at schools that have been living that reform and have been doing it without the technology at the forefront. I imagine really magical things happening when the two are combined. Why is it so hard to have a national dialog about anything of significance right now? It seems like we so quickly polarize into political/religious/social camps that we've lost the ability to listen and hear opinions different than our own, and so have lost the ability to deal with any issues of complexity in a civil way. We desperately need a national dialog on education, but it won't be useful to us if it's a "national argument." I'm glad you're reading Littky. I've been waiting for someone to tell me whether or not that's what School 2.0 looks like. Certainly one reason that the revolutionary schools that exist don't get more attention is because people like to talk about revolutionary schools without doing enough hard research to know what's going on around them. I've got a Big Picture elementary school opening two blocks away this fall, and that's not a coincidence. I'm anxious for you to have a closer look and let me know what the Big Picture environment is like. No coincidence is right.